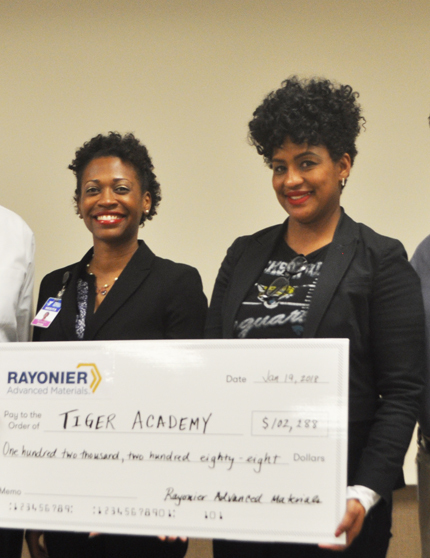 Tiger Academy, the First Coast YMCA’s charter school, recently accepted a $102K check from Rayonier Advanced Materials (RYAM) to sponsor the incoming class of Tiger Academy students for all six years through the RYAM Foundation. In one year, RYAM raised $102,288 through employee donations, which will cover four of the six years that the students are enrolled. Next year, RYAM plans to raise the funds for the final two years. A group of RYAM employees learned about Tiger Academy’s mission by touring the school before unanimously voting to adopt the entire class as part of the company’s philanthropic efforts. Tiger Academy is a free public charter school located in Northwest Jacksonville. Under the YMCA, students are able to enjoy enrichment opportunities and benefit from family support services. 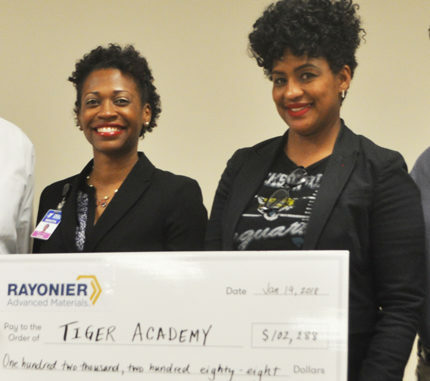 Shown is YMCA Vice President Nekita Nesmith with Tumika Monday, Assistant Principal, Tiger Academy at the check presentation.